Undoubtedly one of the most beautiful ingredients you can lay your mitts on, the pomegranate has been celebrated as a symbol of ambition and prosperity since Ancient Egypt. In fact, it seems that pretty much every ancient culture from the Middle East to the Far East has drawn, praised and written about it. For tonight’s dinner, you’ll be taking the bold step of adding it to this delicious recipe and we’re pretty sure you’ll be making your own little piece of dinner time history. Bring a pot of water to the boil (amount specified in the ingredient list) and grate a little of the lemon zest. Pour the bulgur wheat into the boiling water and add your lemon zest and a pinch of salt. Place a lid on the pot and rest off the heat for 25 mins, or until the water has completely soaked into your wheat. Peel and finely chop the onion and roughly chop the parsley. Cut the tomato in half, squeeze out and discard the liquid centre and roughly chop the remaining flesh. Mix the yoghurt with a dash of lemon juice and a pinch of salt and pepper. Once your bulgur wheat is ready, add a splash of olive oil, a squeeze of lemon juice, your onion, tomato, two-thirds of your parsley and mix together. This is your tabbouleh. Slice the halloumi widthways into ½cm slices. Coat your halloumi with the harissa spice mix. Heat a frying pan on mediumhigh heat with a splash of olive oil. Once hot, add your halloumi and cook until just golden on each side. Tip: Don’t overcook the halloumi, it’s much better when it’s golden but slightly squidgy! 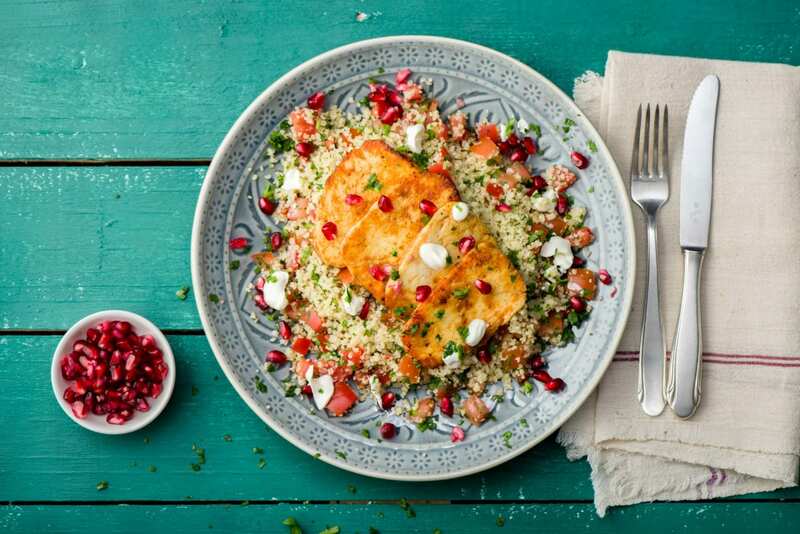 Serve your halloumi with your tabbouleh and sprinkle the pomegranate seeds over the top with your remaining parsley. Drizzle with your yoghurt dressing and fill your boots!